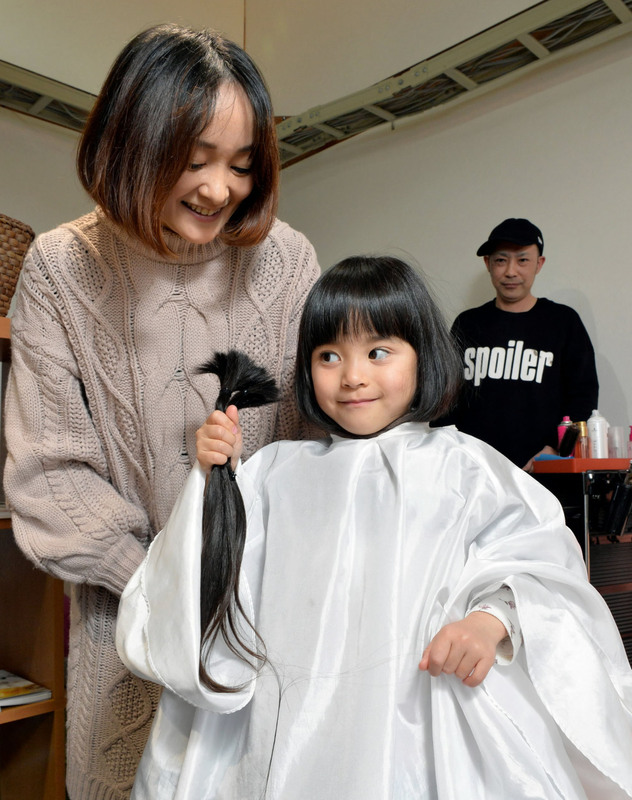 A 5-year-old girl from Aichi Prefecture decided to have her waist-length hair cut in January so it can be made into wigs for children who have suffered hair loss from cancer or other illnesses. 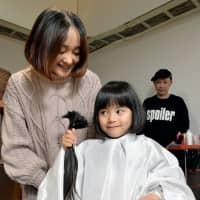 Momoko Kanda was prompted to donate her hair, which had never been cut since she was born, after recalling a girl she saw wearing a hat during a prolonged hospital stay last year. When Momoko was hospitalized for a month in April for a fever and rashes, she would often go to the play room with her mother. She often saw a girl wearing a hat there who was slightly older than her, quietly reading a book. The two didn’t have a chance to talk, but she could not forget her. “Why is she wearing a hat in the room?” Momoko asked her mother Ai, 31, when she returned to her room. Her mother told her there are children who lose their hair due to medical treatment, and that people can donate their own hair so wigs can be made for them. Her mother was touched by the response. “Because I had taken good care of her hair, I was deeply touched by her decision to cut it for somebody else,” said Ai, who had been taking care of her daughter’s long hair morning and night. Four bundles of hair, each about 40 cm long, will be sent from the hair salon to Japan Hair Donation & Charity, a nonprofit organization in Osaka that makes wigs and offers them free of charge. The hair donation movement, which began in the United States, became widely known in Japan around 2015, when actress Ko Shibasaki donated her hair. There are several organizations that accept hair donations, but donated locks should be 31 cm or longer, in most cases. Dyed or permed hair can also be donated. Making each wig requires hair from about 20 to 30 people, and the process takes anywhere from several months to a year to complete. This section features topics and issues from the Chubu region covered by the Chunichi Shimbun. The original article was published Feb. 28.